While the more inexpensive wood garage cabinets may not last as long, they can serve your purpose in a pinch. They can also last longer if they are well taken care of. Particle board is the least expensive wood, but it is also the most delicate and can break or chip if handled roughly. This type of wood cabinet is best suited for on the wall, rather than as a stand alone unit that would see more wear and tear. 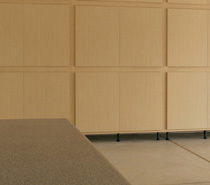 Perhaps the best advantage of wood garage cabinets is the ease with which they can be adapted to you space. Wooden units are easier to have custom designed than their metal or plastic counterparts. You can also buy second hand wooden cabinets and if they are too big for your space, you can always size them down. Our Brand name quality cabinets are the best in the industry for a reason! Not only are they strong, durable, and good looking, but feature an amazing price for what you get. Compared to our competitors our cabinets cannot be beaten for the price. You will get a quality, strong, long lasting cabinet system for a great price and receive a warranty*!